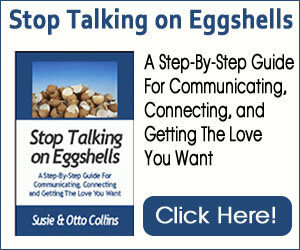 Why does communicating with your partner sometimes seem SO DIFFICULT? You’ve got something to say about a troubling situation and you just can’t seem to say it in a way that will really be heard. In the past, an argument and defensiveness occurred when you spoke up. Because of this, you might mostly choose to remain silent on particular topics. You simmer and get more irritated and resentful. Your partner can’t figure out what is wrong and you both pull away from each other. What if you could communicate honestly and openly about anything that was on your mind AND keep your connection strong and healthy? The trick with effective communication is not so much in what you say, but in how you say it. This isn’t about being manipulative with your words, it’s about being mindful. Chris is irritated because his wife Elaine has a habit of paying the household bills late. He’s always taken pride in being on time and gets really angry at Elaine when he finds out they’ve had to pay (another) late fee because a bill was paid late. The thing that galls Chris is that they have plenty of money in their bank account. From his point of view, the only reason why Elaine can’t pay the bills on time is because she’s disorganized and gets distracted easily. He’s tried to be patient. He’s tried to gently remind her that a bill is about to be due with post it notes by her computer. He’s also tried to take over the bill paying, but Elaine gets offended and digs in her heels. She’s unwilling to give this up and promises she’ll do better next month. As you can imagine, Chris and Elaine don’t resolve their disagreement about who will pay the bills when the conversations opens with hostility. It’s absolutely understandable that Chris would be frustrated and angry. He feels like he’s been patient about this and nothing is changing. When you’re ready to charge in to your partner with an accusation or angry words, we urge you to stop yourself. Calm down and get clear. Find out what is most important to you regarding this situation. Just about everybody wants to feel respected. Especially if you two are talking about a topic that you don’t agree about, be sure your partner knows that you respect him or her. You can follow this phrase with the word “and” to bring up that sensitive issue. Asking for forgiveness can be overdone and can become meaningless, so give this phrase some thought before you say it. Acknowledge it if you are saying “I’m sorry” in order to get your partner to apologize. Watch your motives. Without taking on more than his share of the problem, Chris says to Elaine, “Please forgive me for storming into the kitchen angry. I’m sorry that I’ve been critical of you.” After apologizing and listening to Elaine’s response, then Chris can ask her to talk with him about bill paying. This phrase is wonderful if you can’t comprehend what your partner has just said to you or why he or she acted in a particular way. Don’t guess or make up stories about what you think your partner means or what his or her motives are. Instead, ask. “Please help me understand why it’s important to you to be the one to pay our bills,” Chris asks Elaine. As long as he says this without sarcasm in his voice, she’s likely to give him an answer that will help him truly understand. There may be some other way she can meet whatever need she has related to taking care of finances. There might be another option that neither of them has considered before. When communication is open, they can figure out what that is. Gratitude is right up there with respect when it comes to things everyone wants to feel from others. Be genuine and specific when you express your thanks to your partner. Remember, there is really no action too insignificant. At the end of their conversations, even though Elaine still wants to be in charge of paying the bills, she does tell Chris that she’ll think about this. For once, neither of them is shouting or angry and Elaine admits to Chris that their current system isn’t working very well.